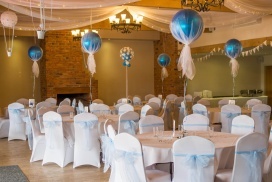 We know how important it is to have your venue looking exceptional. It needs to incorporate your vision and your ideas and that’s where we come in. 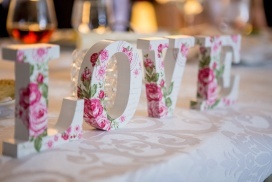 After we get chatting to you on how your venue should look and feel including colours and any themes you have in mind we set about coming up with ideas for colours, table centrepieces, chair coverings and general room styling including wall draping. Your venue dressing is in good hands with Crest Events so contact us and have a chat on how we can help, we cover Glasgow and the central belt. The latest trend is having a LED Dance Floor at your event. Check out our Instagram for examples on events we have organised in the past or visit our LED Dance Floor page for more details or contact us to discuss your ideas and needs. 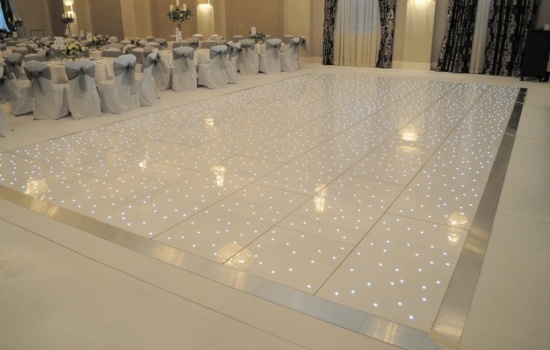 White LED Dance Floor for Hire, Silver Trim. We have a large range of giant letters and numbers for hire which is suitable for any event. 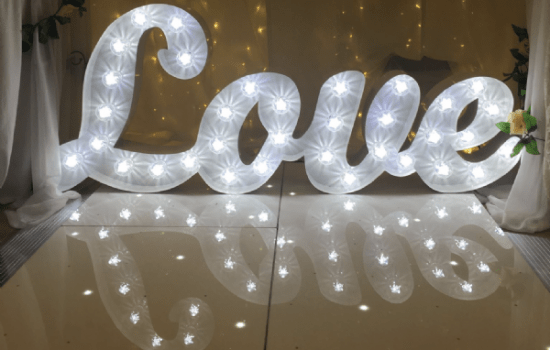 Our most popular requests include LED love letters, LED initials and led letters that spell PROM or GRAD 19. Check out our giant letters page for full pricing and pictures. 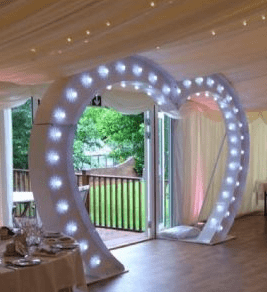 Set your event apart from all the others by hiring our new in LED love heart arch. With 60 fairground light bulbs it will be a popular focal point for your guests to take pictures under and talk about. Full pricing can be found on our LED hire page. Availability is limited for our arch as its popular, you can reserve it by putting a deposit down to reserve your date. Having worked on many projects never any two the same, we are experienced on how to style different venues with different needs. 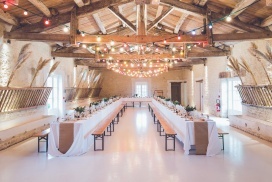 Rustic old country buildings can benefit from flowing wall drapes being sure not to hide the beautiful old beams above to contemporary conference halls where we match colours and themes that represent the focus of the event. 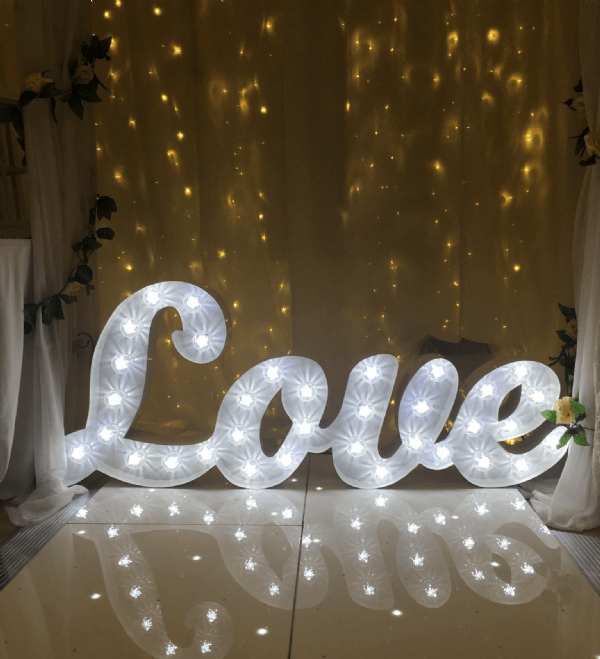 An important part of venue dressing is the lighting; being able to create a good atmosphere for a wedding is a must and for birthdays and celebrations having the correct amount of lighting can be the difference between a full or an empty dance floor!